Elgato EyeTV Sat Free USB, избор от онлайн магазин с ТВ тунери. Открий сам най-добрата цена! Experience the stunning quality of free-to-view satellite television in full HD on your computer’s high-resolution display. A USB 2.0 device, EyeTV Sat Free connects the computer directly to a satellite dish and receives all unencrypted broadcasts. When EyeTV Sat Free is used together with EyeTV Netstream Sat (sold separately), two users can watch different TV channels at the same time. EyeTV Sat Free is compatible with Windows 7, works great with Windows Media Center, and comes with THC software for Windows. Many of the same features offered by Elgato’s EyeTV software are supported. Experience the stunning quality of an HD television picture on your computer’s high-resolution display! EyeTV Sat Free is a great value TV tuner for free-to-view satellite television. It connects to your satellite dish and universal LNB to deliver unencrypted DVB-S2 broadcasts directly to your Mac or PC. EyeTV Sat Free records the DVB-S2 signal unaltered to give you the full quality MPEG-2/H. 264 file as encoded by the broadcaster, both in HD and standard definition. EyeTV Sat supports multilingual programming, Teletext and Dolby® Digital sound. EyeTV Sat Free stands on its own as a great value satellite TV tuner for Mac or PC. But it also has the unique ability to turn EyeTV Netstream Sat (sold separately) into a dual-tuner. Digital Video Broadcast Satellite (DVB-S) is the standard used for direct broadcast satellite services in many parts of Europe and around the world. DVB-S delivers excellent picture and sound quality thanks to high bandwidth and modern video compression methods. 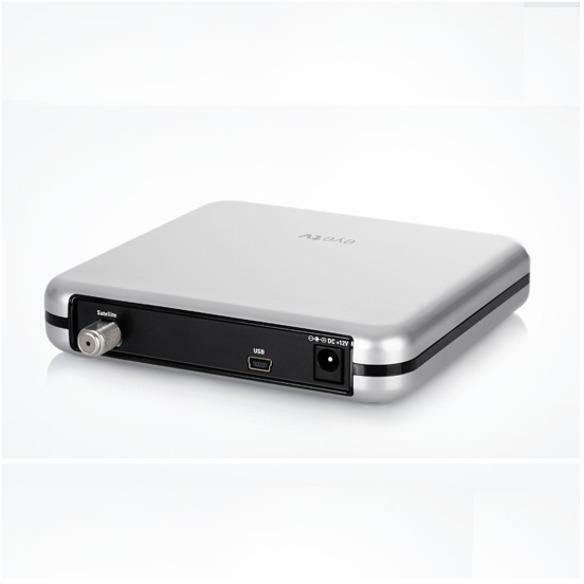 DVB-S2 is an enhanced version with a larger data stream, and it is commonly used as a platform to deliver HDTV via satellite. 720p or 1080i HD features require an Intel Core 2 Duo processor.